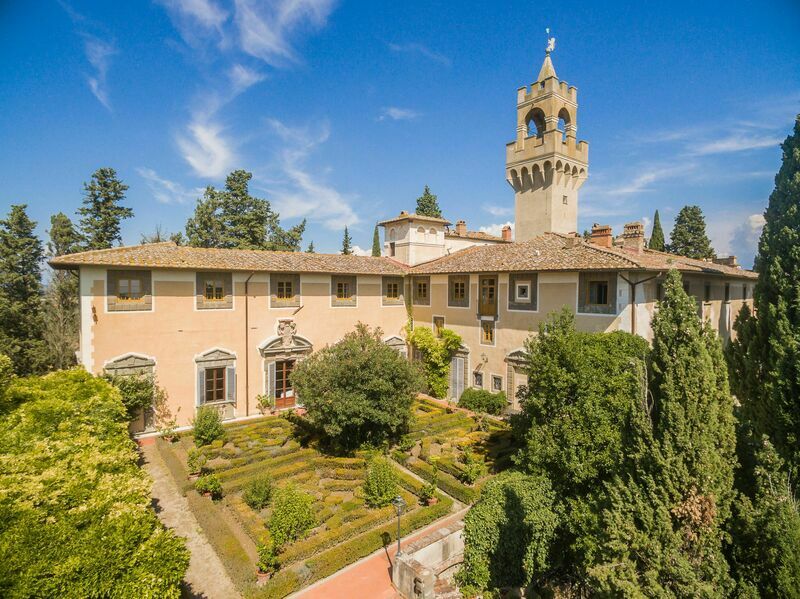 Wonderful castle dating back to the 12th century, restored in the 17th century by the noble family of Acciaioli, with a magnificent tower built on the model of the one of Palazzo Vecchio in Florence. Montegufoni castle is part of a large estate comprising vineyards and olive trees in the heart of Chianti region. Distances from the villa: the small village of Montagnana V.P. with food shops 1 km, Montespertoli with all kinds of shops approx. 5 km, Florence 20 km, Pisa approx. 70 km. A bus stop with busses to Florence, Montespertoli and Empoli is only a few meters from the castle away. Bikes and scooters for rent are available in Montespertoli. At guests’ disposal: large and very charming terraced park furnished with garden furniture and table tennis, beautiful Italian gardens (dating back to the 18th century) with lemon trees and swimming-pool (12 x 6 m - open from 01/04 to 31/10). Reception open from 8.30 to 12.30 and from 14.30 to 18.30. The outbuildings of the castle as well were restored and turned into charming apartments. The castle is run by the Posarelli family. A nice restaurant offering nice recipes of the local Chianti tradition is open every night (from April to October except on Tuesdays). Laundry with shared washing-machine (€ 3,- / per washing). WI-FI internet connection available in some apartment, in the reception and restaurant area. Extra services: on request possibility of renting a baby bed (€ 50,- / per week) and an extra bed (€ 100,- / per week) both payable locally. Maid service available by arrangement (€ 12,- / per hour – payment on the spot). Apartment set in oldest part of the castle. 1st floor: living-room with dining area, kitchen corner and sofa-bed, double bedroom, bathroom with shower.